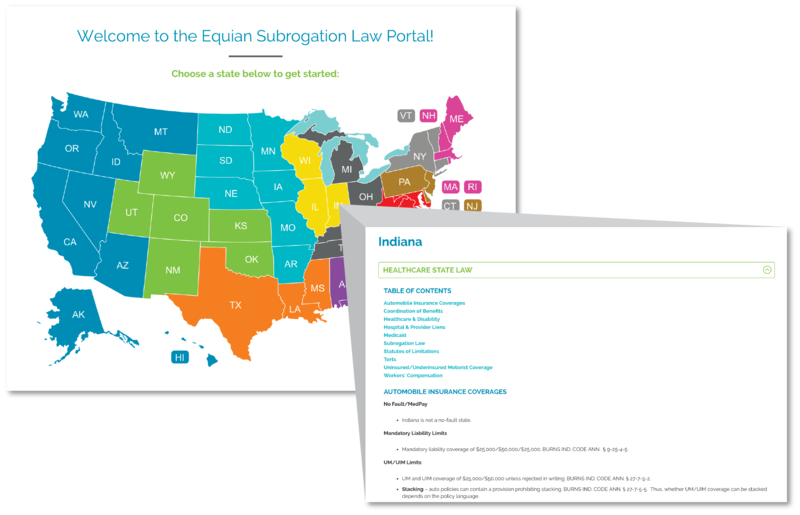 Equian’s Healthcare Subrogation Solution maximizes recoveries with a member-sensitive approach. Our superior model is available on a pre- and post-payment basis and through an outsourced or co-sourced model. Equian’s Big Data platform incorporates billions of data elements that lay the groundwork for our superior partnership approach. Our data is the foundation of our best-in-class recoveries and lowest member touches. Equian continuous scoring utilizes several pieces of information to identify high value recovery opportunity. Our continuous scoring and continuous machine learning continue to achieve more accurate results with even greater speed and intelligence. Even in second-pass reviews, our solution identifies significant recovery opportunities left behind. Our integration with databases (national and state) uses integrated data and analytics to remove false positives. If the information is available without touching the member, we obtain it using national databases, state databases, or social media. Our multi-channel engagement (Web, IVR, Mobile Enabled, Chat, Bots, Artificial Intelligence, etc) ensures when we do contact a member, we spend minimal time with them for high-value-added tasks. We utilize resources that are trained in empathy and prepared to handle difficult conversations and offer several ways for members to engage. Equian offers clients a subrogation law portal that can be accessed anywhere through a PC or mobile device. All state and federal legislation is updated immediately as legislation changes. The information is shared with clients via the password protected portal. Throughout our process, our extensive expert legal staff are engaged as needed. Bring Long-Standing Relationships with Third-Party Lien Administrators to Resolve Effectively. Exponentially advance your other party liability by aligning with Equian.